Skills you will learn in the game offer a boost to your characters. Honing these skills will power up your level and improve your performance in game. Open the Skill window, click and drag the skill to the desired quick slot at the bottom corner. To activate the skills from the Quick Slots, press keys F1-F8. You can target a monster and then activate a skill in the action bar with a left click or use the hotkey on your keyboard to perform a skill. You can also drag-and-drop an active skill to a single slot to the left of the Quick Slots. After you right click on a monster to lock it, the active skill will be used. In Gods War, you have to fight with your weapon against numerous monsters. Some of these bad guys are hard to kill and can take a lot of damage before they die. Some of them are nothing more than one hit kills for most players. 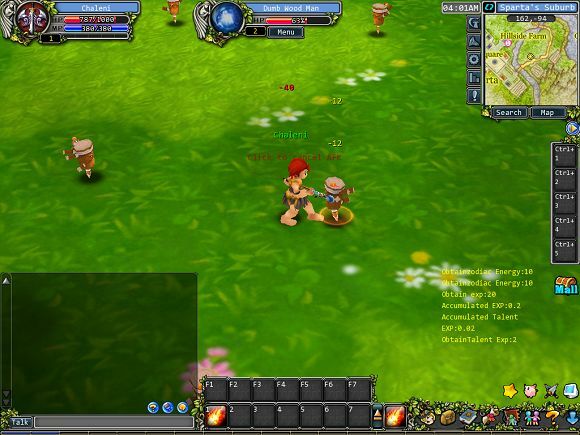 If you are a newbie, your best bet here to power level fast is to kill easy monsters. You can attack by double left-clicking a valid target within range of your weapon or by targeting a monster and pressing a hotkey with a skill assigned. You can also press the F12 key to turn on auto-attack.